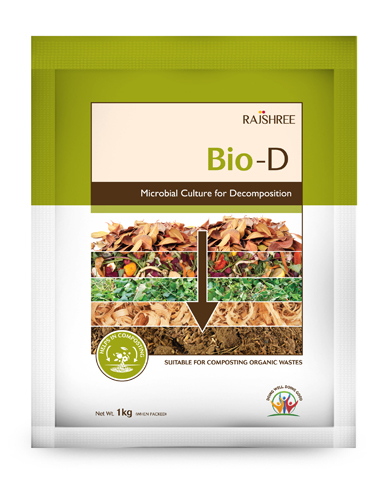 BIO-D is a formulation that contains 10 beneficial microbial cultures. These live aerobic microorganisms are specially developed for composting or degrading organic wastes like sugar factory press mud, cow dung, poultry waste, distillery spent wash, coir pith sugarcane trash, bagasse, some forms of city garbage and other agricultural and biodegradable industrial wastes. 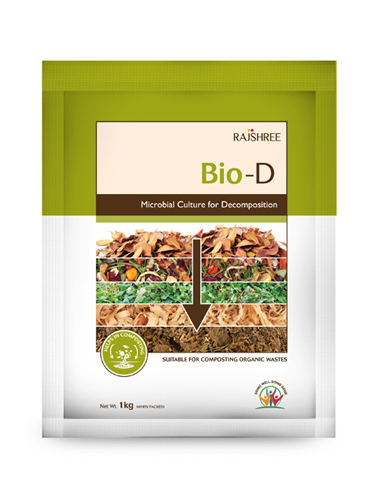 BIO-D helps to accelerate the decomposition process with increased temperature and humification, resulting in shorter composting period and lesser odour issues. It is most efficient on cellulose, lignin and other organic wastes. It is harmless to human beings, animals, birds and plants. Highly effective in aerobic composting of organic solid wastes and effluents. Suitable for in situ composting. Accelerates decomposition process to reach more balanced C:N ratio between 10:1 and 20:1 within 6-7 weeks. Speeds up and sustains temperature of the compost heaps (between 60 – 70o C) which results in elimination of pathogens, pests and weed seeds totally. Helps in maintaining hygienic conditions in farms, compost yards, waste collection sites and garbage dumping yards.